Nestled in the Mule Mountains, Bisbee is a beautiful border-town that many artists call home. The town continues to grow into a quirky place that offers unique experiences with an authentically local flare. You won’t find any chain stores in this desert oasis, so you’re sure to find a one-of-a-kind experience in each place you visit. Want to experience Bisbee for yourself? 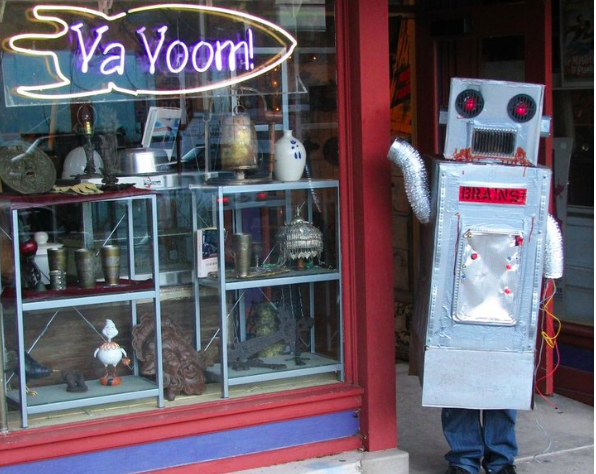 VA VOOM: A THRIFTER’S DREAM COME TRUE! This shop offers hand-crafted items, from vintage to new, as well as some locally-made finds. You can find this neat shop when you first come into town. Stop in and you’ll be sure to score a one-of-a-kind trinket, shirt, poster, or who-knows-what: they have a ton of awesome stuff! (Unfortunately, no, the robot’s not out there greeting you everyday). Both old and new, the owners pick items that’ll make your heart happy and your wallet even happier. This vintage store has some of the best treasures at a fraction of the cost compared to most shops of its caliber. Redbone is located on Subway Street and open 7 days a week, so you can stop in anytime for an amazing shopping experience! Located at 79 1/2 Main Street, you can find this alleyway bookstore that offers some of the best classics, comics, how-to books, and local history books available. Search the stacks here for a book you’ll be able to keep for years. I don’t care what these millennials are saying, print’s definitely not dead. Sense of Place Gallery is located at the end of Brewery Gulch and has amazing pieces that reflect different concepts and styles. This gallery exhibits plein air paintings of scenes from Bisbee Arizona and the surrounding landscape. The owner, Carol, also sells some amazing honey from her own bee hive. We recommend stopping into the brewery located in Bisbee Gulch and then walking down the street to enjoy these beautiful pieces in the gallery. Have a pain that won’t leave you alone? Just looking to treat yourself? Warm Hand Therapeutics is here for you. This massage therapy location offers many massage types such as relaxation, deep tissue, medical, and Lomi Lomi (a Hawaiian style massage). Enjoy your trip in Bisbee a little more by relaxing with a massage at Warm Hands Therapeutics-you won’t regret it. Want to find more local businesses in Bisbee and around Arizona? Visit our Local First Arizona directory.